Q: I’ve been hearing that drinking celery juice in the morning has some health-promoting benefits. Should I try it? A: Celery juice seems to be the latest detox trend sweeping social media. It’s an evolution of the juicing trend, which many physicians and dietitians I’ve worked with (myself included) find frustrating. Our bodies all actually have their own built-in detox machine – the liver. If you treat it right with healthy food, physical activity and a healthy body weight, it can do the heavy lifting in eliminating toxins from your body. Drinking juice won’t magically fix it or enhance it. Don’t get me wrong – celery is awesome. It contains ample amounts of vitamins C and K, as well as folate, potassium and antioxidants. Studies have suggested it may help reduce inflammation and boost cardiovascular health. Plus it’s low-calorie and can be a smart addition to any weight-loss plan. But a few things happen when juice is extracted from celery. First of all, juicing strips away the fiber, which is what makes you feel full in the first place and contributes to good gut health. Then, everything else becomes concentrated – including the sugar. 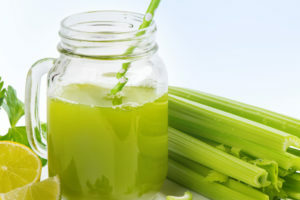 While celery juice has relatively low calorie and sugar content, in most commercially available products it’s mixed with other kinds of juices that mask its bitter taste and also add lots more calories and sugar. Sometimes there’s even some extra vitamins and minerals thrown in for more “detox magic”! The problem is, there isn’t really any proof that those pricey juices do anything for your body. So, celery juice isn’t bad for you. But we shouldn’t fool ourselves into thinking that it can reverse an unhealthy diet, make us lose weight or cure our ailments. Your money would be better spent if you buy the whole celery stalk and incorporate it into a whole-food diet full of fruits, vegetables, healthy fats, whole grains and lean proteins.